Do you want a Valentines present that she (or he) will remember for years? Picture a tuxedoed quartet showing up at your sweetheart’s office, your favorite restuarant, or your home to deliver the most memorable Valentine ever! 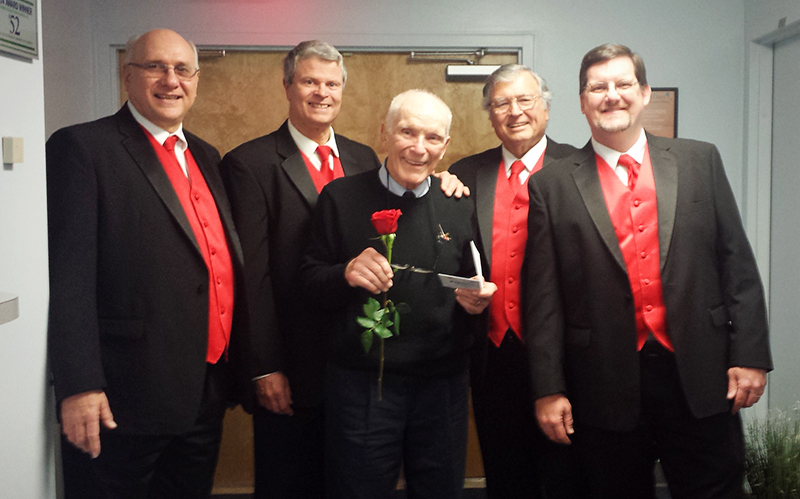 A Barbergators Chorus quartet will deliver love songs, a red rose, and a personalized card (and whatever else you provide) to your sweetheart on Valentines Day! Contact us for more information. Two love songs for your sweetheart by a Barbershop Quartet! Call the Valentines Hotline at (352) 358-1131 to find out what times are available and place your order. Singing Valentines will be scheduled on Thursday, February 14, 2019 into 2-hour windows. We will do our very best to arrive as close to your desired time as possible! Payment options will include cash, check, and credit card.